A lot of good emails this week regarding some of the latest happenings in Bachelor Nation. One thing a lot of people are still asking about is the “Bachelorette” gig and who’s gonna get it, and do you think so-and-so has a chance, etc. It might be a question I’m gonna have to start removing from “Reader Emails” just because we don’t know enough yet. I’m gonna keep giving the same answer no matter how many different names you throw at me? All I can do is repeat what I’ve always said. There have been 14 Bachelorettes. Every one of them finished in the top 4 of the season they were on. If you want to give me a name of someone who didn’t finish the top 4, and list all the reasons why you think they should be it, that’s fine, but I don’t know what you expect me to say in return. They cast the men before they cast the lead knowing who their main candidates are. But very few people bow out because the network chose some lead over the one they wanted. I think that happens moreso with the women. The guys don’t really care. They just want to be on and, due to ego, figure any woman must want them. They certainly aren’t gonna bow out because they feel they don’t match up with whoever the lead is. Rarely, if ever, happens. So just keep that in mind over the next few weeks as we get closer to “Bachelorette” talk. I don’t know who they’re choosing. We know who the candidates are. But until it’s the day before or even the day of, they can change their mind since now they have numerous people sign a contract, then choose one as late as they can. So yes, while it’s winning it’s demo every Monday night and killing it in the Women’s demographic as well, which is what advertisers are after, lets not say that this season is doing as well as past seasons. It’s just not. Those numbers bare it out. Yes, the market is filled with more options every year and that’s why the overall viewership drops every season. I think the biggest thing they can hang their hat on is the fact that after 17 years on the air and 37 seasons, the fact that they’re winning ANY demo on a given night is impressive. Shows just don’t last this long on TV. 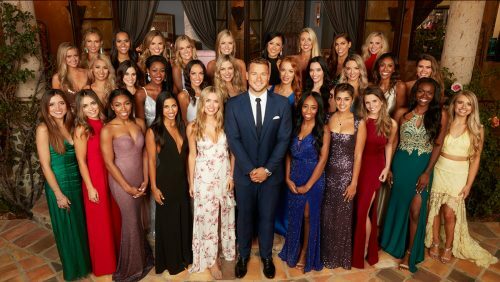 And the staying power of the “Bachelor” franchise is quite a sight to see. Hey, I’m all for it. Keeps my site going. But the hyperbole some of the execs are throwing behind this season based on their numbers is just a flat out lie. They’re just very well aware of their audience’s ignorance when it comes to ratings talk like this, so they feel they can get away with it. “Temptation Island” sure was a doozy last night. You can read Nell Kalter’s recap here. When you’ve got Morgan straddling Evan in the bed and you’re hearing things like “I want you to take them off…I want it all off…grab it all off…”, you knew this was not going to be a pretty sight for Kaci to witness. You’ll hear her on the podcast tomorrow with her reaction to what she saw last night. Remember, she’s seeing the episode for the first time every Tuesday like everyone else. Obviously she knows what already happened out there since this was filmed in September, but to actually see it is a different story. And if you thought last night was bad, ummmmmm, tune in next week. I’d say next week’s podcast with Kaci will be as must listen as you can get, because even I have questions about what the hell you’re gonna see. Not to mention, I think I’m going to have a surprise for everyone next week as well. Stay tuned.